Book Review: Scramble by Tom Neil. This book was just sheer excitement. It was Biggles for real. When Scramble was offered to me I thought it was the war in the air from a historian’s point of view but I soon discovered it was written by one of Britain’s last Ace’s. As a young man Tom Neil was one of those, good looking, smiling, clean cut patriotic lads. The industrious kids who were proud of Britain for reasons apart from being good at athletics. He thought the King and Queen were smashing, he was proud of the Empire and didn’t flinch at putting country before himself. To Neil the thought of an objector was abhorrent, and he had no qualms about backing up his convictions by going into action to fight the vile “Hun”. This chap was hardly 19 when the Battle of Britain began, yet like so many others there was hardly any reserve. Like a character from WE John’s creation or the like, Neil longed for action, and a crack at the enemy. When the first casualties started coming in during the early days of the war, his ardour was heightened rather than dampened, though he grieved for lost friends one gets the impression there wasn’t much time to indulge in such a luxury, not when you were likely to be flying on average 3-4 sorties a day. Doubts about death or the morality of killing ones fellow man didn’t come into it. Sleeping, eating and scrambling was what kept pilots occupied in mid 1940. Scramble is a compilation of 3 books, so it’s quite long, but Neil’s style is an engaging one. 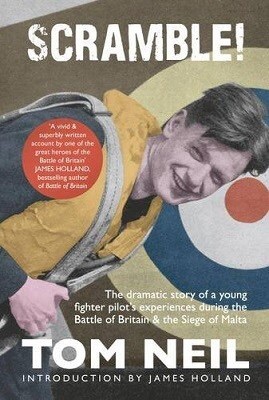 Part classic memoir, in which there is humour, a touch of drama and anecdote, and part action novel, in which the reader seems to be with Neil in the cockpit of his Hurricane, thinking his thoughts and feeling his reactions. It begins with his early life in Manchester, his introduction to flight and obsession with joining the RAF. The obstacles thrown in his way to get there. Whether it be his parents, or the snobbish officers at his first interview who took dislike to him because he came from Manchester and took the train because he had no car. Back in the pre war days the recruitment process was apparently more selective. Joining as a volunteer got him in the air, and away from his home to Scotland where with the phoney war in full swing, he finished his training and got a little instruction in some of the more worldly aspects of being a fighting man as well. The book follows his career, in which he scored enough kills to be considered an ace several times over and is now the highest scoring fighter pilot left, through the Battle of Britain into the defence of Malta. Reading this book I just couldn’t shake the feeling that this generation was indeed truly remarkable for their ability to look death in the face, trouser their hands and smile. Neil’s remembrances are sharp, not always kind, but usually gracious. For instance he has an affecting way of handling profanity as well, which is refreshing when you chat usually step into a high street anymore without hearing what Neil would call a “Holy word”. Not that the account is sanitised, these are just the many ways by which we can hear a very personal voice. And alongside his combat experiences are nuggets of his personal life which allow for contrast. The passages are as one would expect littered with casualties, no sooner is a man introduced than Neil will observe heavily that “poor” this or that, he was killed later, or afterwards we found out he had been shot down. As the casualties mount such sentences become more frequent yet, in the thick of it there was only the briefest of gaps to toast a missing face in the mess. The recollections of action, air warfare before the jet, are fascinating. I like detail, even if I don’t know about the subject, and I’m not a pilot, I like to know that I’m in the hands of an expert. The phraseology Neil uses to describe aircraft leaves one in no doubt that this man saw it with his own eyes. Searching for the enemy in the tinder boxes called Hurricanes, the first sign of them as they climbed to altitude was the garden of brown flak blossoms bursting. Beyond which, as they got closer, emerged the fly like dots of fighters and the droning slug like shapes of bombers. Dogfights are fast and furious, your not even sure what’s going on, sometimes the fight ends so arbitrarily it beggars belief. The act of shooting down an enemy plane seemed to come slowly to Neil, but it wasn’t out of disinclination. And there is a distinctly impersonal nature to air warfare, as if the pilots found it easier to fight because they could shoot at machines, and forget about the people in them. There is some merit to the idea that you should read general histories before hitting primary sources, but when it’s a book like Scramble I’d suggest you do just that, scramble and get a hold of it. 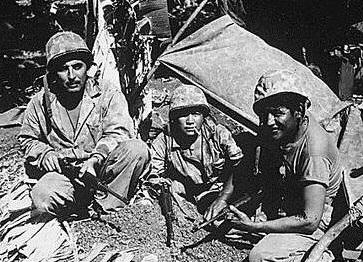 Navajo Code Talkers, Saipan. 1944. Wikipedia. This is the first part of a little series dedicated to the Navajo code talkers who served in the US Marines in World War 2. These were men who for half their lives had been told to forget their language and culture, and yet enlisted to defend their country, a country that had more often than not persecuted them and told them that unless they changed they weren’t welcome to be a part of it. Ironically it was their language, the one that America tried to suppress that helped secure victory in the Pacific. 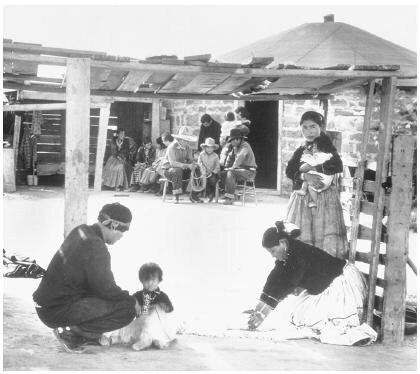 Navajo family domestic scene 1939. Traditionally the Diné people, or the Navajo didn’t celebrate birthdays, for Peter MacDonald who was to his recollection born in May or June 1928 it was puzzling to be given the birthday December 16th by the United States Government. His parents were from rural Four Corners, near Teec Nos Pos in northeastern Arizona it was a farming community and they had a small place with some sheep, horses, and cows. The family were basically self sufficient, moving with the seasons between four corners, the mountains and Utah. His young experiences were all bound up in a fluid multi layered, very Navajo oriented world. Bounded by the peaks of the four sacred mountains, Sisnaajíníí (Sierra Blanca) to the east, Tsoodził (Mt. Taylor) to the south, Dook’o’ooslííd (San Fransisco Peaks) to the west and Dibé Ntsaa (La Plata Mountain) to the north. One of these experiences was to watch his grandfather load up his dump truck with coal to take to sell to boarding schools. For Peter the connection between the truck driving away out of their rural neighbourhood and his grandfather coming home with money, which he would use to buy things, made a big impression. When asked what he wanted to be when he grew up, he’d reply, he wanted to drive a dump truck like his grandfather, or maybe to work in an office. Navajo Children born at the turn of the 20th century grew up in small close knit farming communities whose livelihood depended on livestock and what they could produce from the soil. Chester Nez’s family were sheep farmers during the 1920s and 30s in Chi Chil Tah, New Mexico. His mother died when he was very young but like other young Navajos he was able to lean on the family unit; his grandparents and aunts and uncles, on the reservation. There he grew up helping tend a flock of over 1,000 animals. It was a hard life in a hard country, especially in winter, when the snow banked up to a man’s waist, and the only water had to collected by hand in barrels. Conditions weren’t helped by the empty promises made by the Bureau of Indian Affairs to improve housing and living standards. Chester philosophically remembered a humble, honest, rough life but figured it was something that he had to go through. He wasn’t alone, Joe Vandenver Sr. Who was raised in a traditional Navajo way, was toughened from birth to face hardships positively. To the extent that his father would throw his children naked into deep snow in order to help them endure the cold in the long run. Traditional tribal values remained important to the Navajo. Whose tribal structure was based on a number of individual clans. 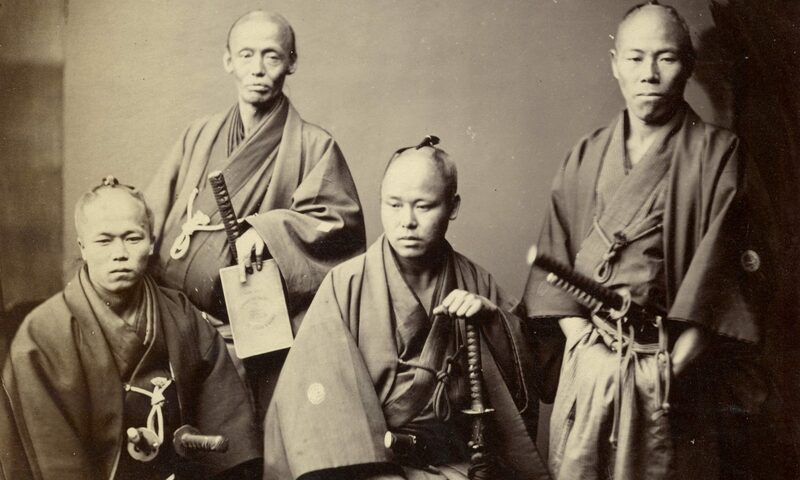 They were so remote from the rest of the United States that it was relatively easy to maintain a sense of a separate culture within communities. Samuel Tom Holliday had been born in monument valley, he was raised by his parents, his mother taught her children about the natural world and made sure they grew up fit and strong. Until he was 12 he had never heard an English voice. He was raised on stories about the cruelty of the White man during the long walk, from his grandmother, whose mother died in the ordeal. These stories affected him deeply and were all too common. Bill Toledo was an all round strong man. Like most other children he was inducted into the life of a sheep herder at a young age, (no more than 5 years old). Yet he did dream of the world outside the closed Navajo community. Once he watched a plane soar overhead and wondered what it would be like to be up that high, like a bird. He would look out towards mount Taylor and wonder what was on the other side. His parents died when he was still young and Bill was raised by his grandparents who brought him up in the traditional manner. Every morning he awoke with the dawn to pray with his grandparents. When the first snow fell he was told to strip and roll in the snow for a short while, to keep him strong and healthy. When he was watching sheep, he might chose to sit and relax when his grandfather would ride up on horseback and ask him why he was just sitting around. Shouldn’t he be running somewhere? Mistakes would be met with scolding from his grandmother. Both grandparents placed great store in exercise and activity, Bill would often run barefoot with his grandfather, who regularly used to leave him in the dust until he got older. Life was tough, the BIA consistently failed to improve housing and living standards in the reservation. Then just to make it harder came the livestock reduction. The tribe had been herders since Spanish Colonial times and in the treaty of 1868 which had delineated the initial limits of the reservation, the tribe was given 15,000 sheep and 500 cattle. Which had been expanded to 500,000 by the 1920s. Federal assessors had calculated the Navajo could maintain 500,000 sheep on the reservation. By 1931 the number was as high as 2,000,0000 animals. 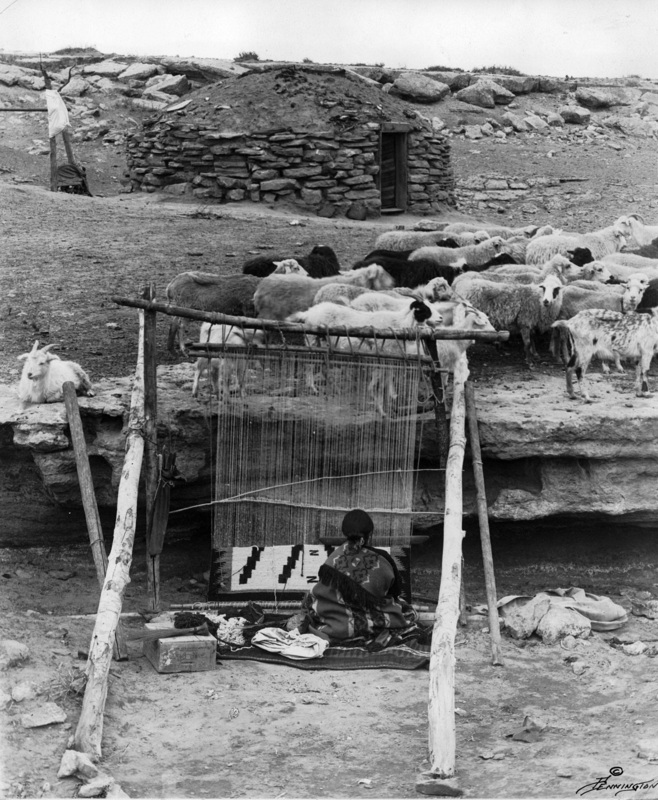 The maths are testament to how capable the Navajo were at animal husbandry, the tribes’ wool accounted for half of the cash income for an individual Navajo, and constituted the only source of livelihood for women. However the government was adamant that they were overgrazing and ruining the land. Without consulting the tribe, Commissioner of Indian Affairs, John Collier ruthlessly pushed through legislation to remove up to 80% of the Navajo livestock. Agents appeared thereafter to buy up animals and the tribal flocks were decimated, the horses, goats and cattle deemed superfluous were taken away for destruction. Chester’s grandparents and aunts and uncles watched with tears streaming down their faces as the sheep were herded into a pit or trench, soaked in paraffin oil and set alight. Not even the lambs were spared. The livestock massacre, coming at the height of the Great Depression, broke the back of the fragile Navajo economy and rammed home just how helpless and powerless the tribe was over their own destiny. Peter MacDonald never aspired to anything that he could not see. Therefore he desired nothing more than to be like his grandfather, and although he knew he was a leader, a chairman of the Navajo Nation Peter would have been content just to drive a truck or work in an office, and nothing more. Despite having no aspirations to go to college, he enjoyed maths at the local school, where he learned to write, read and speak basic English but Peter was then enrolled in a BIA run boarding school at Baycone. He soon found the alien environment, away from his family and familiar routines of home life suffocating. He was picked on by bigger students, and the faculty were cold and mean to him. After the 6th Grade he dropped out and apprenticed under his grandfather for a year to become a medicine man. However after that year he dropped out of that as well and went looking for other work. Peter’s experience of boarding school was not unusual. Already the treaty had done its best to dismantle Navajo values, principally by introducing the concept of private property. Incentives being put in place to encourage the tribe to become independent farmers. But these “Indian Schools” were in reality “De-Indianising” stations where everything children had been taught to believe was drummed out of them so they could become, “Americans”. They were given birthdays if they didn’t have any, and Anglicised names to replace their Indian ones. Chester Nez went away to school were he had no choice but to learn English. Here the Navajo language was discouraged as was all aspects of their culture. “It was pretty bad,” he said, this was an understatement, and the students suffered week long punishments of they were caught talking in Navajo. 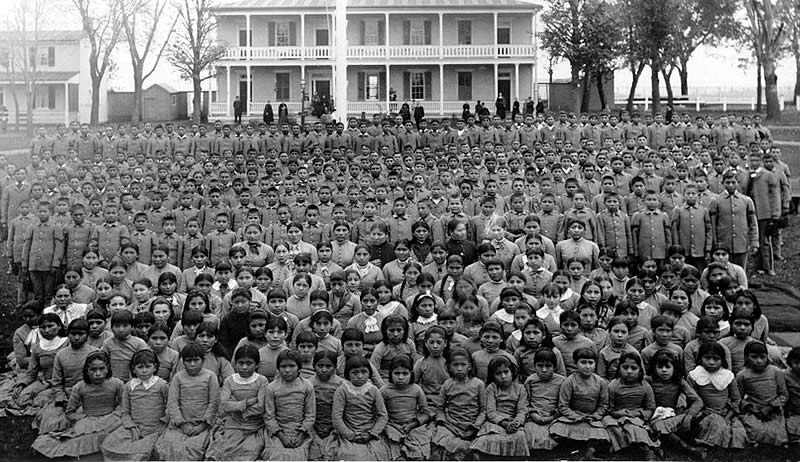 The famous Carlisle Indian School in Pennsylvania was just one of many schools set up to make sure new generations of Indians forgot about their culture and history. 1900. Wikipedia. Keith M. Little, born in Arizona, was an orphan raised by his sisters and relatives. Sent to Ganado Mission school, he was subject to the same harsh rules and discipline of the system and was repeated told how “dumb” he was. Parents would try to keep their children at home for as long as possible, but if children over a certain age were discovered they were sent away. Samuel T. Holliday was 12 when he injured his leg and was hospitalised for 3 months, in which time he was taught basic ABC’s and numbers in an adjoining room. One day his mother came and asked when she could take her boy home, but the officials told her that Tom had to go to school, she pleaded with them not to take him, but they’d didn’t listen. Tom arrived at school and was greeted in Navajo, but then informed it would be English from there on in. It was one of the hardest experiences of his life. He suffered from bullying, the strict rules and the confusing language. Snitches were a common problem and after being outed for speaking Navajo he would be punished on Saturdays and Sundays, scrubbing the walls and hallways. He was sent at 13, but most kids would go at 5 so it was incredibly hard for him to catch up. Sam used to trade cookies to other kids in return for teaching him English so he wouldn’t be beaten by the teachers, corporal punishment was a staple of boarding school life. The name Kee Etsicitty Basically means Boy Blacksmith. Born in May 1924, Kee was sent to boarding school, were the government issue him “normal clothes”, a new name, fed him three meals a day and beat him if he spoke his own language or didn’t learn English fast enough. Bill Toledo had attended a local school, taking the bus that came around to collect students from their houses or sheep herding camps. At the time Bill went to boarding school his hair was long, like all Navajo children. It flowed down to his waist and he usually bunned it back so when he wore the straw hat his grandfather gave him he looked almost like a Mexican. When he went to boarding school he was told he didn’t need his long hair there. The government was strict on anglicising the Indians, like the others he was not allowed to speak Navajo, if he did his mouth was washed out with yellow laundry soap, and his hair was cut off to conform with American standards of decency.